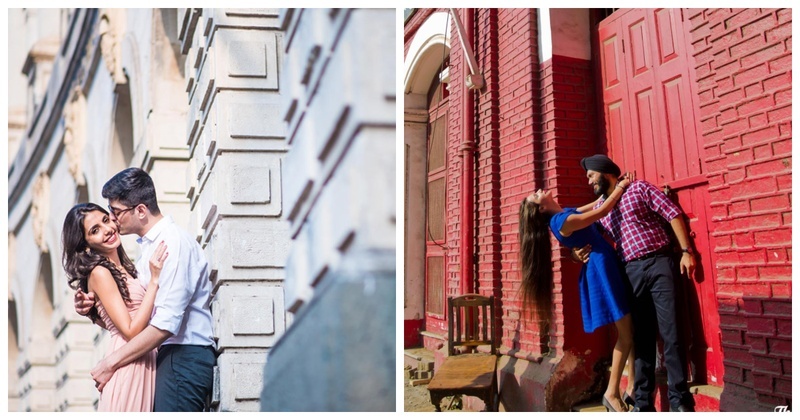 10 Offbeat Locations in Mumbai that are Perfect for your Pre-Wedding Shoot! Dr. Bhau Daji Lad Museum is the oldest and most iconic museum in Mumbai, and definitely a great location for your pre-wedding shoot. The interiors will leave you spell bound. Don a gown and tuxedo and don’t forget to take pictures on the Raichand approved staircase! If you schedule a photoshoot during February, you have to take a couple of shots at the Kala Ghoda Art Festival! With its art installations and hordes of people, you’ll be able to capture a moment that screams “So very Mumbai”, a personal fav location for pre wedding shoot in Mumbai! If you’re already in Kala Ghoda, why not drop by Kitab Khana? They have a huge book collection and also a book cafe known as ‘Food for Thought’ that serves delicious food and some really good coffee! Pictures amidst books is always a good idea. Fancy some Victorian charm? Then you’ve got to stop by Ballard Estate for your photoshoot! The buildings and street will take you back to the 20th century. It’s a part of Bombay that has never changed it won’t change in the future either! Originally known as the Shor Bazaar, Chor Bazaar is Mumbai’s personal treasure trove. You’ll find all sorts of antiques here and you can definitely pose with a few! Go on a Friday to get the most of Chor Bazaar. Bombay Samachar is the oldest newspaper to be published in India. Their brick red building is now one of the most iconic places in Mumbai. If you want a funky and quirky photoshoot, head to the colourful Chuim Village in Bandra. Mumbai’s very own derby the Mahalaxmi Race course is an excellent place to get some fancy-shancy photos clicked! Adjacent to the Mahalaxmi Race course is another fancy hotspot, Gallops. The food is delicious but the interiors and the overall decor of the restaurant will pull you towards it! Aarey Colony’s haseen wadiyan and khula aasman will make you wonder aagaye hum kaha? A breath of fresh air, Aarey colony’ Chota Kashmir is a delight for you eyes and lungs! Why don’t you recreate Yeh Reshmi Zulfein, Yeh Sharbati Aankhen during your photoshoot? Now none can say that Mumbai has only a handful of places for a pre wedding photoshoot!